Excerpts from: Brown Rosen, E., E. Sideman, A. M. Shelton, B. Caldwell and C. Smart, 2006. Resource guide for organic insect and disease management [Online]. Cornell University College of Agriculture and Life Sciences. New York State Agricultural Experiment Station. Available at: http://www.nysaes.cornell.edu/pp/resourceguide/ (verified 18 March 2010). Late blight (causal agent Phytophthora infestans) is a very difficult disease to control organically in regions where potatoes are grown on large acreage and rain occurs during the production period. Organic farmers should practice best cultural management to manage this disease. However, in some regions, even when all best organic management strategies are adopted, if inoculum is blowing in from off-farm sources, potato cultivars are not resistant, and weather conditions are conducive to disease development, a late blight epidemic can occur. Once late blight is initiated in a field, disease progress can occur very rapidly, killing all aboveground plant tissues within one or two weeks. In regions of the world where late blight epidemics occur frequently, prophylactic copper applications are applied. As required by the certification process, farmers must use all available alternative practices to manage late blight, and describe these in the Organic System Plan, before deciding to apply a copper product. Copper fungicides are on the National Organic Program National List as synthetics. They are regulated for use as disease management tools, with the restriction that they must be used in a manner that minimizes copper accumulation in the soil. Like any other synthetic pesticide used in organic agriculture, a farmer must first adopt all available alternative management practices and show that those practices are not sufficiently effective. Specific preventive and alternative measures would include destruction of cull piles, planting of disease resistant cultivars, roguing/destruction of diseased plants, irrigation management, and wide row spacing. Farmers applying copper products should periodically soil test for copper to track trends in soil copper contents. Copper fungicides can be highly effective if applied prophylactically (before infection) and with complete coverage of all plant foliar surfaces, including the undersides of leaves where the pathogen typically sporulates. In the European BlightMOP project, across many trials in countries across the EU, foliar potato late blight was controlled on average by 27% with an average yield increase of 20% (Speiser et al., 2006). In a single season field trial at Oregon State University in 2007, four applications of 1.9 lbs elemental copper as cupric oxide suppressed foliar disease development by 88% (Stone, 2007). 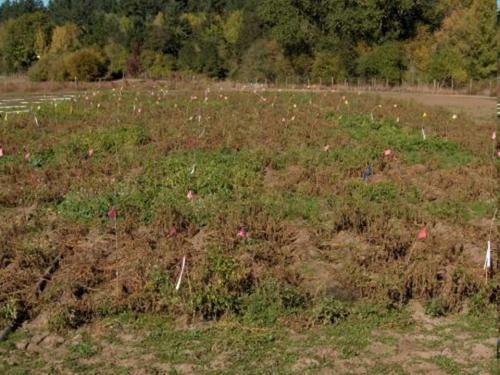 A late blight spray trial was conducted at Oregon State University in 2007. Copper fungicides, compost tea, and other materials approved for use on organic farms were tested for efficacy against late blight. Only the copper materials effectively controlled late blight, as can be seen in this photo. All green plots (living potato plants) are copper product treatment plots. The potato plants are completely dead in the control and all other treatment plots. Photo credit: Alex Stone, Oregon State University. Following absorption into the fungus or bacterium, the copper ions will link to various chemical groups (imidazoles, phosphates, sulfhydryls, hydroxyls) present in many proteins and disrupt the function of these proteins. Thus, the mode-of-action of copper hydroxide (or any other copper fungicide) is the nonspecific denaturation (disruption) of cellular proteins. The toxic copper ion is absorbed by the germinating fungal spore and thus for best results copper must be reapplied as plants grow to maintain coverage and prevent disease establishment. To find formulated products that are acceptable for certified organic production, check the OMRI Products List and the WSDA Brand Names List. See related article Can I Use This Product for Disease Management on my Organic Farm? For information on making and applying Bordeaux mixture, see the publication 'Bordeaux Mixture' (Donaldson et al., 2000). NOTE: Before applying ANY copper product, be sure to 1) read the label to be sure that the product is labeled for the crop you intend to apply it to and the disease you intend to control, and 2) make sure that the brand name product is listed your Organic System Plan and approved by your certifier. The oral LD50 of copper sulfate is 472 mg/kg in rats. Toxic response in humans has been observed at 11 mg/kg. Ingestion of copper sulfate is often not toxic because vomiting is automatically triggered by its irritating effect on the gastrointestinal tract. Symptoms are severe, however, if copper sulfate is retained in the stomach, as in the unconscious victim. Injury to the brain, liver, kidneys, and stomach and intestinal linings may occur in copper sulfate poisoning. Copper sulfate can be corrosive to the skin and eyes. It is readily absorbed through the skin and can produce a burning pain, as well as the other symptoms of poisoning resulting from ingestion. Skin contact may result in itching or eczema. It is a skin sensitizer and can cause allergic reactions in some individuals. Eye contact with this material can cause conjunctivitis, inflammation of the eyelid lining, cornea tissue deterioration, and clouding of the cornea (Extoxnet 1996). Copper hydroxide is less acutely toxic, with an oral LD50 in rats of 833 mg/kg. It is also not readily absorbed through the skin, with a dermal LD50 of over 5000 mg/kg in rats (Nufarm Americas Inc., 2004). Absorption of copper sulfate into the blood occurs primarily under the acidic conditions of the stomach. The mucous membrane lining of the intestines acts as a barrier to absorption of ingested copper. After ingestion, more than 99% of copper is excreted in the feces. However, residual copper is an essential trace element that is strongly bio-accumulated. It is stored primarily in the liver, brain, heart, kidney, and muscles (Extoxnet, 1996). Vineyard sprayers experienced liver disease after 3 to 15 years of exposure to copper sulfate solution in Bordeaux mixture. Long-term effects are more likely in individuals with Wilson's disease, a condition that causes excessive absorption and storage of copper. Chronic exposure to low levels of copper can lead to anemia. The growth of rats was retarded when given dietary doses of 25 mg/kg/day of copper sulfate. Dietary doses of 200 mg/kg/day caused starvation and death (Extoxnet, 1996). Copper sulfate has been shown to cause reproductive effects in test animals. Testicular atrophy increased in birds as they were fed larger amounts of copper sulfate. Sperm production was also interrupted to varying degrees. Reproduction and fertility was affected in pregnant rats given this material on day 3 of pregnancy (Extoxnet, 1996). There is very limited evidence about the teratogenic effects of copper sulfate. Copper sulfate may cause mutagenic effects at high doses. At 400 and 1000 ppm, copper sulfate caused mutations in two types of microorganisms. Such effects are not expected in humans under normal conditions (Extoxnet, 1996). Copper sulfate at 10 mg/kg/day caused endocrine tumors in chickens given the material outside of the gastrointestinal tract through an intravenous or intramuscular injection. However, the relevance of these results to mammals, including humans, is not known (Extoxnet, 1996). Long-term animal studies indicate that the testes and endocrine glands have been affected (Extoxnet, 1996). Heart disease occurred in the surviving offspring of pregnant hamsters given intravenous copper salts on day 8 of gestation. Copper does not degrade in soil and there are serious concerns about the cumulative effect of copper applications on soil copper contents and soil biology. In the European Union, copper fungicides have been banned completely in the Netherlands and Denmark, and use has been restricted to 6kg/ha/year (5.4 lbs/A) elemental copper in other EU countries since 2006. These regulations were directed at perennial cropping systems in which copper applications are made annually, resulting in a high likelihood of soil copper accumulation, but the regulations also apply to annual cropping systems. In annual rotational systems, where copper applications are only made every 4-6 years, copper accumulation is less of a concern, but nonetheless, copper use is regulated and certified organic farmers in the US are required to restrict their use of copper products. Copper fungicides are protectants, so they MUST be applied to the foliage before infection. The copper ion is absorbed by the germinating spore, and the copper denatures spore proteins. Once infection has occurred, copper has no effect on disease progress in the plant. Because there is no 'kick-back', coppers must be applied regularly throughout the potato production season, beginning when potato plants emerge. In some regions, this strategy can result in 8 or more sprays per season. In dry conditions, coppers stick well to plant surfaces without adding a sticker to the tank mix, so when plants are not growing, sprays could be less frequent. However, when the potato foliage is growing rapidly, applications are required more frequently in order to protect new foliage. In the European BlightMOP project, potato late blight was effectively controlled with as little as 6 sprays of 0.9 lbs elemental copper per acre each as oxychloride, and this total application rate (5.4 lbs Cu per A) fell within the EU guidelines (6 kg/ha, or 5.4 lbs/A). In a single season field trial at Oregon State University in 2008, four applications of 1.9 lbs elemental copper as cupric oxide (highest label rate, Nordox) (total Cu application: 7.6 lbs Cu/A) strongly suppressed disease development (Stone, 2007). It is possible that Nordox could be effective at 0.9 lbs elemental copper/A per spray. Monterey Chemical, the US distributor of Nordox, is currently investigating the efficacy of lower Nordox rates. Copper is toxic to plants, particularly in large doses and at high temperatures. Symptoms of excess copper are reddish-brown leaves, followed by an uneven yellowing. These leaves will wilt and become dessicated. Leaves in this condition are also more susceptible to frost damage. Copper toxicity rates may result in reduced fruit set of tomatoes and in extreme conditions may even kill plants. Copper will be more toxic to plants in acidic conditions and more effective against disease under higher pH conditions, so a program to maintain soil pH is an important part of a strategy to maintain plant health. Because copper accumulation is practically irreversible, limitations on copper use is a serious concern for organic farming. Copper is bound, or adsorbed, to organic materials, and to clay and mineral surfaces. The degree of adsorption to soils depends on the acidity or alkalinity of the soil. Because copper sulfate is highly water soluble, it is considered one of the more mobile metals in soils. However, because of its binding capacity, its leaching potential is low in all but sandy soils (Extoxnet 1996). Copper is a necessary plant and animal nutrient, but it is toxic to plants and other organisms at high levels. It is always present at a background level, but can be of concern in situations of heavy agronomic use of copper compounds. Agricultural soils are reported to have average background levels of 20-30 ppm (Baker 1990), with average overall US level found to be 15.5 ppm (Holmgren 1993). Some vineyard soils in Europe, which have seen intensive use of copper sulfate containing Bordeaux mixtures for 100 years, have soil Cu concentrations ranging from 100 - 1500 ppm (Besnard 2001). Maximum soil concentration rates for copper in New York soils have been recommended based on soil type, from 40 ppm (sandy soils) to 60 ppm (silt loam) to 100 ppm (clay soils) in order to protect against phytotoxicity and negative impacts on soil life (Harrison et al 1999). Typically, each spray with a copper-based fungicide results in an application of 1 to 4 lb. of copper per acre (raising the topsoil concentration from 0.5 to 2 ppm), and often several copper sprays are made per season. Thus, under a heavy copper spray program, toxic topsoil levels could be reached in a matter of decades. Some certifiers recommend that growers include copper in their soil testing program in order to determine a background level and track any changes in that level as a consequence of repeated copper spraying. Copper sulfate is practically nontoxic to birds. It poses less of a threat to birds than to other animals. The lowest lethal dose (LDLo) is 1000 mg/kg in pigeons and 600 mg/kg in ducks. The oral LD50 for Bordeaux mixture in young mallards is 2000 mg/kg (Extoxnet, 1996). Copper sulfate is highly toxic to fish. Even at recommended rates of application, this material may be poisonous to trout and other fish, especially in soft or acid waters. Its toxicity to fish generally decreases as water hardness increases. Fish eggs are more resistant than young fish to the toxic effects of copper sulfate. Copper sulfate is toxic to aquatic invertebrates, such as crab, shrimp, and oysters. It is used as a pesticide to control tadpole shrimp in rice production. The 96-hour LC50 of copper sulfate to pond snails is 0.39 mg/L at 20 C. Higher concentrations of the material caused some behavioral changes, such as secretion of mucous, and discharge of eggs and embryos (Extoxnet,1996). Bees are endangered by Bordeaux mixture. Copper sulfate may be poisonous to sheep and chickens at normal application rates. In some orchards, most animal life in soil, including large earthworms, has been eliminated by the past extensive use of copper containing fungicides (Extoxnet. 1996). Copper has been found to suppress rates of nitrogen fixation by the bacteria Rhizobium under some situations at relatively high copper levels of 235 ppm (OMRI, 2001). Earthworms are sensitive to several heavy metals and may accumulate them in their tissues. Copper is a relatively non-specific bactericide and fungicide and can kill naturally occurring microorganisms on leaves as well as those that have been applied as biocontrols including Bacillus sp., Trichoderma and others. Copper is a valuable tool for organic management of late blight in potatoes and tomatoes. However, it cannot be relied upon as the sole means of control. An integrated program of preventative and alternative practices which could include field design and fertility and irrigation management should be used in combination with copper applications to manage late blight of potato and tomato. Before applying ANY copper product, be sure to 1) read the label to be sure that the product is labeled for the crop you intend to apply it to and the disease you intend to control, and 2) make sure that the brand name product is listed your Organic System Plan and approved by your certifier. Baker, D.E. 1990. Copper. p. 151-176 In B.J. Alloway (ed.) Heavy metals in soil. Blackie and Sons Ltd.
Besnard E., C. Chenu, and M. Robert. 2001. Influence of organic amendments on copper distribution among particle-size and density fractions in Champagne vineyard soils. Environmental Pollution 112:329-337. Brown Rosen, E., E. Sideman, A. M. Shelton, B. Caldwell, and C. Smart. 2006. Resource guide for organic insect and disease management [Online]. Cornell University. New York State Agricultural Experiment Station. Available at: http://www.nysaes.cornell.edu/pp/resourceguide/mfs/06copper.php. (verified 18 March 2010). Note: the brand name list in this article is outdated; check with your certifier before applying any copper product. Donaldson, D., W. H. Olson, and R. D. Raabe. 2000. Bordeaux mixture [Online]. University of California IPM Online. Statewide IPM Information Program. Pest Notes Publication 7481. Available at: http://www.ipm.ucdavis.edu/PMG/PESTNOTES/pn7481.html (verified 18 March 2010). Extoxnet. 1996. Copper sulfate [Online]. Pesticide Information Profiles. Extension Toxicology Network. Available at: http://extoxnet.orst.edu/pips/coppersu.htm (verified 18 March 2010). Harrison, E. Z., M. B. McBride, and D. R. Bouldin. 1999. Land application of sewage sludges: an appraisal of the US regulations. International Journal of Environmental Pollution 11(1): 1-43. Holmgren, G. G. S. , M. W. Meyer, R. L. Chaney, and R. B. Daniels. 1993. Cadmium, lead, zinc, copper, and nickel in agricultural soils of the United States of America. Journal of Environmental Quality 22: 335-348. Leifert, C. Undated. Blight-MOP: Development of a systems approach for the management of late blight in EU organic potato production [Online]. Available at: http://ec.europa.eu/research/agriculture/projects/qlrt_1999_31065_en.htm (verified 18 March 2010). United States Department of Agriculture. Agricultural Marketing Service - National Organic Program. National List [Online]. Available at: http://www.ams.usda.gov/AMSv1.0/ams.fetchTemplateData.do?template=Templa... (verified 18 March 2010). Nufarm Americas Inc. 2004. Champion wettable powder. Material Safety Data Sheet. OMRI (Organic Materials Review Institute). 2001. Copper sulfate for use as algicide and invertebrate pest control. NOSB Technical Advisory Panel Review. Speiser, B., L. Tamm, T. Amsler, and J. Lambion. 2006. Improvement of late blight management in organic potato production systems in Europe: field tests with more resistant potato varieties and copper based fungicides. Biological Agriculture and Horticulture 23:393-412. Stone, A. 2007. Materials for late blight management: unpublished data from the Ospud project [Online]. Available at: http://ospud.org/materials_for_late_blight_management (verified 18 March 2010). Stone, A. 2009. Organic management of late blight of potato and tomato (Phytophthora infestans). eOrganic article.